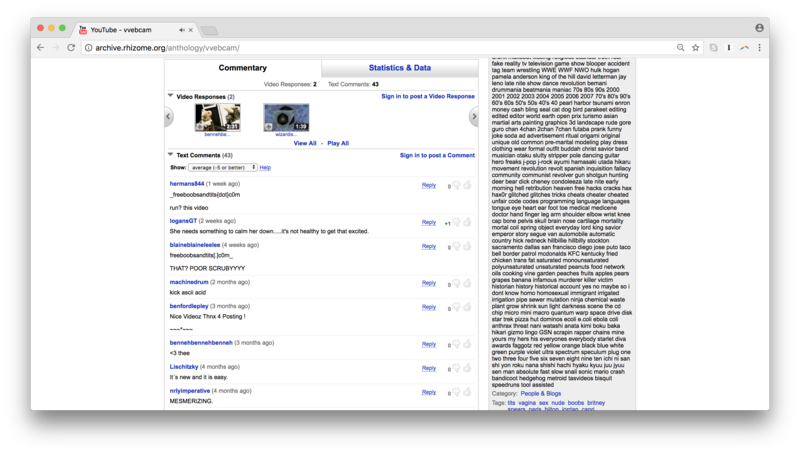 Yesterday's Net Art Anthology entry brought another YouTube classic, Petra Cortright's VVEBCAM (2007). And as with Ann Hirsch's Scandalishious, I was blown away by the restoration of late-aughts YT. This capture differed, however, in some key ways. In particular, it’s more “slice-of-life,” less a comprehensive archive of a durational YT experience, as with Ann's work. So, I reached out to Dragan Espenschied, who oversaw this restoration, to ask a few questions. ZK: Pardon me, Dragan. I’m slacking you to ask a few qs about the VVEBCAM restoration. First, how did you approach this complex task? DE: The essential part was to treat it not as a video, but as a performance on YouTube, at least to provide a glimpse into that context. ZK: So you had to compose that glimpse, right? Selecting key comments, responses, recommendations that captured the moment? DE: The YouTube page you see in the reconstruction was re-assembled from parts found in public web archives. Luckily enough, there was enough material around to show a pretty exciting state of the work. As in, how anarchic corners of YouTube used to be, and how the artist knew how to interact with it. ZK: One thing to note is that this isn't Rhizome’s first archival copy of VVEBCAM. Ben Fino-Radin, then Rhizome’s digital conservator, acted quickly to restore access to the video after YouTube originally took it down. This resulted in a reconstruction of the video as it appeared when embedded on Cortright’s website, but it did not include the YouTube performance aspect. So how did we get from that archival copy to this new, higher-fidelity restoration? DE: In 2011, Rhizome only had access to a copy of the video file originally uploaded by the artist. (That same one is still embedded on the new page.) Replicating YouTube wasn't really an option. Today, we can capture the YouTube part using Webrecorder and its archival extraction feature from resources held by the Internet Archive and the Library of Congress. Back when the video was online, web archiving wasn't really up to the task of storing embedded videos. We were lucky to find archival captures of the YouTube page that included images, formatting, and text, but no video. After extracting these static elements, I then inserted the video from our archive. ZK: So basically we had to build the preservation tools ourselves. To be fair, Petra’s work is good reason to undertake a multi-year, resource-intensive development project! DE: Well, there were 2,000 other good reasons in Rhizome’s archive as well. But the preservation tools we make are really helping to reduce the amount of work that has to go into a project like this. I’m not ashamed to say the process didn't take longer than 4.5 hours—including manually fixing many parts that had to be changed for the presentation. ZK: Wow. Okay, speaking of time, I know you need to go. But do you have a good contemporaneous YouTube video to share? If not, I can just outro with The Crazy Frog. DE: This one comes to mind: https://www.youtube.com/watch?v=FjeMDvCdrtc. It was around before YouTube though, as a WMV file that traveled from site to site. ZK: Nice. Thanks, Dragan! And fwiw, here’s The Crazy Frog.